I remember from my teen-age years a letter to Dear Abby, or maybe it was to Ann Landers, asking advice on the proper way to seat toilet paper on the holder. Should the loose end pull from the top of the roll or the bottom? asked the letter writer. Apparently this was a source of contention in her household. She and her husband actually argued over this trivial matter. I suspect there was something more going on in that marriage besides the battle of the over or under. It’s the same in the world of knitting. We knitters contend over trivial matters. Nothing gets knitters riled up and taking no prisoners quite like the great debate—charts vs written instructions. Many a flame war has begun on many a knitting list when a knitter innocently posts a complaint that a particular pattern has written instructions but no charts, or vice versa. It seems knitters have very strong preferences, and many of them appear to think every other knitter must feel the same as they do. It is just human nature, I think, to assume that others see things as we do. But it makes for conflict. I’m a chart person. If a lace or Aran design isn’t charted, I chart it. My preference for charted designs is perhaps due to my being a visual learner. When I was in elementary school, my older sister and I were enrolled in Saturday French classes. The classes were entirely oral, and I was entirely lost. It was just gibberish to me because I didn’t know what the words looked like. I can remember begging the teacher to write the words on the chalkboard so I could see what they looked like. She refused and I never looked back. No French for me in high school. I took Latin. I think I prefer charts because I can see what the design looks like. Other knitters find charts hopelessly confusing. At least one knitter I know of has brain lesions due to MS that make it impossible for her to read charts. Not difficult, impossible. She is incapable of reading charts. The symbols just look like random squiggles to her because her brain cannot process them. She is unable to even write written instructions from the chart because of her disability. Of course, some types of designs virtually require charts. It’s rare to see instructions for Fair Isle or many other types of stranded colorwork written out. Oh, it’s certainly possible, but the designing itself is usually done on a graph, and writing out line-by-line instructions for any type of knitting that involves frequent color changes would be tedious, to say the least. Although I am a chart lover, I feel for the knitters who find they cannot follow charts. Charting is pretty much the standard now in stranded, lace, textured, and cabled knitting. 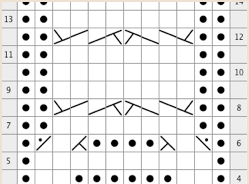 Commercial pattern publishers nowadays often publish charted stitch patterns without writing out line-by-line instructions. The best patterns, in my opinion, are the ones that include both written and charted patterns. But doing so takes expertise, time, space, and money, and too many commercial publishers nowadays are interested only in making as much money as they possibly can.